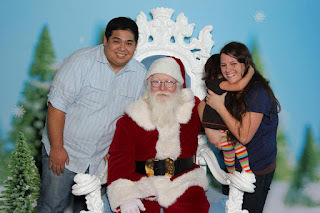 We ventured out to NorthPark Center to once again visit their famous Santa Clause. Since we are pretty much professionals now, we arrived at the mall, or "shopping center" as the snooty NorthPark people will say, at 830AM. A good two and half hours before the lines open to actually take a picture with Santa. At 830AM, we were already 48th in line. The real professionals had brought lawn chairs and iPads and saved their spot as if they were waiting in line for U2 tickets. The biggest obstacle was trying to keep the Baby sane for the time we were there. Luckily she took a nap so we didn't have to worry about a fussy baby. The Baby was dressed in her Christmas outfit with her cute little bow and she was the happiest baby there...until we attempted the handoff to Santa. Maybe next year will be different when the Baby finally understands Santa's magical powers or maybe she just loathes the guy. Who knows. We even thought it was just that particular Santa until we decided to partake in a free Santa photo session at the airport. Different guy, same results. It's always fun to see true fear photographed. We wish everyone a Merry, not as petrified, Christmas! She's still absolutely adorable. I love her dress.